While classical economics is based on the notion that people act with rational self-interest, many key money decisions—like splurging on an expensive watch—can seem far from rational. The field of behavioral economics sheds light on the many subtle and not-so-subtle factors that contribute to our financial and purchasing choices. 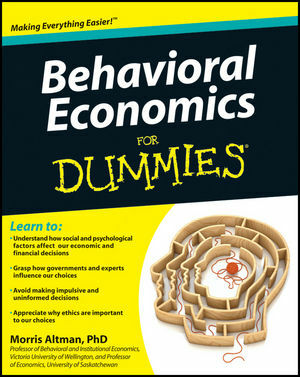 And in Behavioral Economics For Dummies, readers will learn how social and psychological factors, such as instinctual behavior patterns, social pressure, and mental framing, can dramatically affect our day-to-day decision-making and financial choices. Based on psychology and rooted in real-world examples, Behavioral Economics For Dummies offers the sort of insights designed to help investors avoid impulsive mistakes, companies understand the mechanisms behind individual choices, and governments and nonprofits make public decisions. An essential component to improving your financial decision-making (and even to understanding current events), Behavioral Economics For Dummies is important for just about anyone who has a bank account and is interested in why—and when—they spend money. Morris Altman, PhD, is a professor of behavioral economics at Victoria University of Wellington in New Zealand and a professor of economics at the University of Saskatchewan in Canada. He is on the board of the Society for the Advancement of Behavioral Economics and is a former president of that organization. He also edited the Handbook of Contemporary Behavioral Economics.